Welcome To MoJo Bros. Books. We present the BEST in ESOTERIC literature, both new and long-neglected. We are the EXCLUSIVE publishers of the works of the renowned Esoteric Practitioner, Rev. E. M. Camarena, DD, PhD. Rev. Eliot, as he is called, is an internationally known Esoteric Practitioner. He may be heard LIVE every WEDNESDAY on the ASK1RADIO Network. “REV. ELIOT’S MAGICKAL WINDOW” is an HOUR of FREE Tarot Readings! Below are the covers of some of our books! AT A DISCOUNT RIGHT FROM THE PRINTING PLANT! A masterful look at dreams by the great 20th Century writer Lloyd Kenyon Jones. This is THE book to keep by your bedside! Know what your dreams are telling you with descriptions of just about anything you can dream of. This is a full reproduction of the original from 1920 – complete with an introduction by Jones. Recreated from original plates. Not to be missed! Consult this book every morning upon awakening to get ahead in life! THE definitive book on starting out in the art and science of Crystal Gazing. This new edition is a reproduction of the 1928 book, from original plates – complete with contemporary advertising. Features an introduction by famed occultist Rev. E. M. Camarena, known as Rev. Eliot to the fans of his weekly Ask1Radio tarot reading show. Coming soon to AMAZON…. WHY HAS HISTORY IGNORED THIS GREAT MAN? Wall Street Titans Once Flocked To Him For Stock Predictions! Black Herman Performed For Presidents & Royalty! Black Herman Filled Theaters For MONTHS AT A TIME! Now RESTORED & Illustrated With Vintage Black Herman Ads! Rev. Eliot, host of the internationally famous Tarot reading show “Rev. Eliot’s Magickal Window” (on the ASK1RADIO NETWORK) presents a look at the Tarot complete with a CD of actual LIVE tarot readings. Told in an informal, humorous style that is Rev, Eliot’s trademark, the book delves into the mystery of Tarot Card reading. Along with the original text by Rev. Eliot, this large sized paperback book includes two classic works on the tarot. This book offers a unique insight into the world of Tarot. What it is. How it works. What it can do for you… How to become a reader yourself. The long-awaited REVISED and UPDATED version of The Collected Magickal Essays of Rev. E. M. Camarena. When a tree falls in the forest, and nobody is there to listen, does it make a sound? NO! It makes no sound at all. Find the explanation for this paradox in Rev. E. M. Camarena’s entertaining introduction to the Esoteric Arts. A working Esoteric Practitioner, Rev. Camarena opens the Shroud of Secrecy with a set of clear, often humorous essays on Practical Magick. While much literature in the field is obscure, Rev. Eliot cuts to the heart of his subjects with plain talk about how the world of Practical Magick operates. Subjects investigated include Prayer, The Tarot, The Middle Pillar Technique, Will Power, The Bible, Incense, Oils, Happiness, Talismans, Amulets, Black Magick even Life After Death! Each book includes a FREE GIFT! This volume is a must-have for anyone interested in Magick. When a tree falls in the forest, and nobody is there to listen, does it make a sound? Amazingly, NO! It makes no sound at all. Find the explanation for this paradox in Rev. E. M. Camarena’s entertaining introduction to the Esoteric Arts. A working Esoteric Practitioner, Rev. Camarena opens the Shroud of Secrecy with a set of clear, often humorous essays on Practical Magick. While much literature in the field is intentionally obscure, Rev. Camarena cuts to the heart of each subject he addresses with plain talk about how the world of Practical Magick operates. Subjects investigated include Prayer, The Tarot, The Middle Pillar Technique, Will Power, The Bible, Incense, Oils, Happiness, Talismans, Amulets, Black Magick even Life After Death! Each book includes a FREE GIFT! This groundbreaking volume is a must-have for anyone interested in Magick. Handy Pocket Size Edition! Just by coming here you have won 50% of the battle to improve your life… Now read the other half. Should you be at the dawn of realizing that an entire world exists just beyond the edges of your own five senses and are wondering how it all works and what your own place is within it, then this marvelous Magical book is just the one for you. This tightly wrapped volume of essays draws into scope everything you might expect in a book dedicated to western esoteric studies — the occult, rituals, spells, tarot, talismans, black magic, religion, the Tree of Life, as well as a few good pointers of what to do and what is wise not to do. The author illustrates by example the results of his own magical workings which range from sheerly astonishing, to the hilarious. And, I mean to say so funny that you can’t stop laughing and when you do, you want to call your friends and tell them about it! Startled, laughing, and then whispering “wow” to yourself, you hurry to turn the next page for the next surprise. Be fooled not by the size of this snappy little volume, for part of the brilliance of this neatly sculpted work is the very precision by which Camarena streams more highly energized knowledge on its pages than you’d find in stacks of other books on the subject. As he explains how beautifully Magick fits into our daily lives, it seems that he’s walking along next to you, showing you the ropes, the landscapes, scenery and shortcuts in a style so familiar you’ll feel that he’s from your own hometown, taking the uncertainty out of the uncommon. As disarming and charming as the author is accomplished, with a doctorate in biblical studies, a newspaper publishing business, and having theater and film writing under his belt — you may sense the Rev. Camarena’s elegant style, and that he is very smart in addition to being an esoteric practitioner. He knows his stuff and ties up the package by swinging you past the Golden Dawn, Aleister Crowley, the works of Geoff Gray-Cobb and provides a diamond cut clear view of the Central or Middle Pillar Ritual. Everything you need to land on your feet running in the ways of Magick. The book is filled with treats reminisent of an earlier time, I will not reveal these goodies, but will suggest that the author has a formidable knowledge of language, he is a master of words and perhaps the biggest literary surprise will be found at the end of the book, but in truth, the whole book reads like a magical Fourth of July fireworks display on paper. More introspectively, shall I close by commenting that in this complex world of ours, I feel that Rev. Camarena has distinguished himself by his humanitarian nature. By offering so much to anyone willing to read this book, I wonder if he is the type of person who will not move forward unless he is assisting others to progress as well? I do not know the author, but I did ask a question of him via his website which answer was of the kind making me curious to read his book. I’m glad I did, it is well worth its price and it will travel along with me on my journey as well. A VERY popular book! This is the famous Last Speech which William Jennings Bryan planned to give at the end of the 1925 Scopes “Monkey Trial”. Defense lawyer Clarence Darrow outmaneuvered Bryan by electing not to give his own summation; thus Bryan was barred from delivering this oration. The trial was an early “media sensation” and Bryan wanted to address the world via the new invention: radio. If you only know Bryan from the movie/play Inherit The Wind, then you do not know the real man. The playwrights never meant the work to be a documentary. They were writing about INTOLERANCE and used the infamous trial as a back-drop. Bryan had definite fears about how people would use evolution to hurt and exploit the weaker folks among us. Was he right? Bryan never lived to give the speech. In 1925 it was posthumously published. Now you can read his last speech and see if you agree with him – or not. This edition is a facsimile of a 1925 book obtained by the publisher and scrupulously cleaned up for reprint after 90 years. Back in Print At Long-Last! A long-lost book about numerology and how it can enhance your life. Painstakingly restored from a 71 year old copy, and featuring a new forward by internationally-known occultist REV. E. M. CAMARENA, this valuable book is back at last! Get it to learn how numbers can work for you! We have more power than most of us know. The key is KNOWING you can do something and not doubting it. Can we bend metal objects with the human mind? This book recounts my successful adventures in the world of Mind Power and shows you how to do it too! Includes THE TRUTH about that “Amazing Randi” (James Randi) Million Dollar Challenge. Is it real or a scam? Hint: It’s a bloody scam! “The most important book you will ever read!” – Princess “T” of the MoJo Conjure Academy. The Book of Forbidden Knowledge! A 1920s CLASSIC re-issued in a LARGE SIZE facsimile edition with an all new introduction by Internationally known Occult Practitioner Rev. E. M. Camarena, PhD, affectionately known as Rev. Eliot to his fans around the world. This book offers a cornucopia of ritual magickal information that deserves to be on the shelf of everyone interested in the Occult Sciences. All this you will find on just one page of this volume! A classic from the 1940s, “You Can Live Forever!” shows the value and import of every human life. Told from a Roman Christian perspective – but highly significant to everyone – the author takes us on a tour of IMMORTALITY! Filled with insight, this book dramatically shows how our words and deeds live on through eternity after we pass away. How does that happen? You will find the answers revealed in the pages of this profound book. Long out of print, unjustly forgotten, MOJO BROS. CLASSICS revives it for all to see and learn from! PROFUSELY ILLUSTRATED! Literally the VERY BEST BOOK WE HAVE EVER READ on the way to develop psychic abilities!Edited by Noted Occultist Rev. E.M. Camarena. Long out of print, now it’s back! Lloyd Kenyon Jones’ masterpiece on the practice and development of PSYCHIC POWERS! FIRST TIME illustrated with VINTAGE Photographs! The HUNCHES you have may be evidence of PSYCHIC POWERS! This book describes the various powers and tells how YOU can develop them and profit from them! INCLUDES A DREAM BOOK & list of YOUR LUCK DAYS! “Black Magic, as it has been called, is the expression of the superstitions of primitive men. In all of us, to a greater or less degree, there is a bit of the primitive. As we are able to overcome these instincts, we are inclined to scoff at those who still cling to their superstitious beliefs.” – From The Foreword. A CLASSIC book on the art and beliefs of Black Magic in various cultures. This publication marks the long overdue return of a classic in the field. Concise, well ordered and utterly fascinating, this new volume contains footnotes that reflect the latest developments in the field. A MUST HAVE for any occult library! 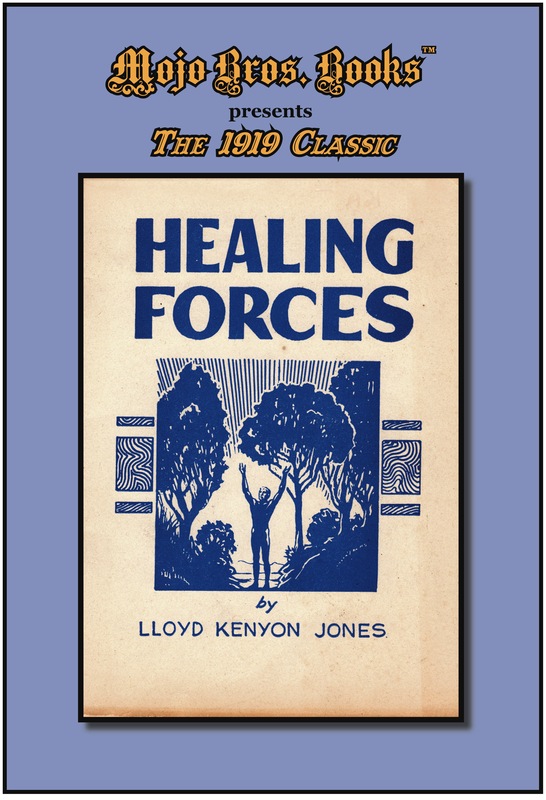 With this stunning, startling declaration, the great writer Lloyd Kenyon Jones began his 1919 book HEALING FORCES. In it’s gripping narrative, Jones chronicles his experiences with Spirit Healing. Not “Faith” Healing, but the use of the universal Healing Force available to all of us. This long-out-of-print book is a MUST READ for all who want to look beyond the purely physical response to illness, typified then and now by allopathic medicine. In this book you will learn about the HEALERS among us who lend their energy to others – even if the healers do not know they are doing so! You will read about the spirit doctors who began on the Earth-plane and – amazingly! – continue their healing from the other side. The revelations in this slim volume are awe-inspiring! If you want to know what illness IS, and not just how to react to it, this is the book for you. YOU FOUND THE FREE GIFT!!!!! CLICK THIS LINE TO CLAIM IT! The classic 1919 book now reissued with new introductions by noted Occultist Rev. E.M. Camarena, PhD. There is no reason to live your life in fear! Wake up to the way orthodox religion & Other “Powers That Be” control the population THROUGH FEAR! An invaluable treatise, this book is a must-read for anyone who wants to lead a free, independent life. A life WITHOUT FEAR! The new introduction puts the book in its historical context and shows why it is still relevant today. Do The Words of the Prophets Have A Meaning For You? The Return of a 1943 CLASSIC! From the original 1943 catalog listing: “Purports to tell: Fortune telling and the Prophets – casting a spell – the Warning of Moses – How To tell true Prophecy, Prophecies of Nostradamus – he predicts last war – this war – downfall of Hitler, etc.. Prophecies to 2000 A.D.!” Long out of print, and much sought after, this small book brings alive the history of PROPHECY from biblical times to the Second World War, when this book was published. A TRUE CURIO for your collection, re-issued at last! A MUST for all OCCULT BOOK collectors! From the early 20th Century comes this long neglected memoir of MRS. CECIL M. COOK, one of the world’s most famous mediums! Filled with passion and heartbreak, this is the story of an outcast little girl, shunned by family, feared by neighbors! Yet despite the odds, she grows up to become WORLD FAMOUS for her ability to contact the departed who now live on in the spirit-world. As you read this saga you will be transported back to the gaslight days of CHILD LABOR! Of religious fanatics who ARRESTED members of the Spiritualist Church! You will read about FLOWERS THAT APPEAR OUT OF THE ETHER! Flowers NO florist could ever recognize! All from the OTHER-SIDE! Read this stunning book and know that EVERYTHING THAT EVER LIVED, LIVES ON! AND LIVES YET! GO INSIDE A GENUINE SEANCE! This is the uplifting story of a heart’s triumph over bigotry, hate, fear and loss. This is one book that should not be missed!